reality of modern life for which we needed institutions that could promote better understanding between people from diverse cultural backgrounds. 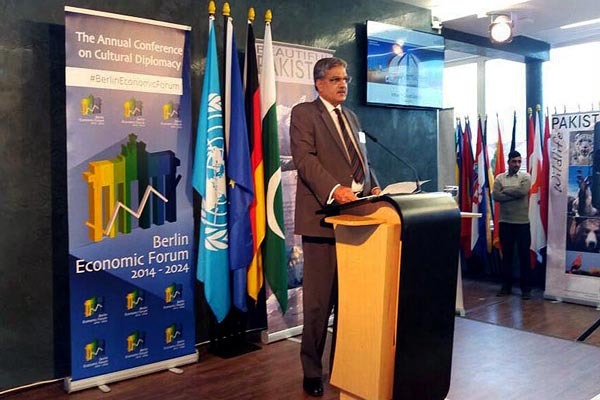 He said this while speaking at the Institute of Cultural Diplomacy (ICD) Berlin, said a press release issued here on Friday. He appreciated the role of ICD in promoting global peace and stability by strengthening and supporting intercultural relations. He said that role of ICD was of utmost importance for a peaceful global society. The minister also highlighted the economic policies of current government in Pakistan and said that with sustained economic growth of over 5 %, the middle class of Pakistan is emerging that has even been noticed by the international world and publications. He said a big boost to Pakistan’s economy is expected in form of China Pakistan Economic Corridor (CPEC) project for 70 US billion dollars would be invested in Pakistan in coming years. In addition to this, CPEC was also a remarkable regional connectivity which would have wonderful and fruitful impact on lives of billions of people of South and Central Asian region. Barjees also illuminated the tourism potential of Pakistan and said that Gilgit Baltistan (GB) with its majestic mountains, innumerable valleys and lakes, was called heaven on the earth. He said that security situation in GB had improved and not a single unfortunate incident had been reported in last three years. A host of infrastructural projects had been completed in GB and many more in pipeline for the facility of foreign tourists, he added. He said that currently two daily flights were being operated for GB and government was planing for opening Gilgit Airport for the international flights in near future in order to attract the foreign tourists. On the occasion, the Minister invited the German community to visit Pakistan to explore its natural beauty and richness of its culture.